David Patmore�s excellent accompanying essay stresses Ansermet�s firm belief in the importance of his own particular style. This was something he could only fully obtain from an orchestra which he himself had carefully nurtured. For this reason he persuaded Decca to let him record �Petrushka� again only three years after his well-regarded 1946 version with the London Philharmonic. It is this question of style which ensures that what, on the face of it, could be considered an excessively literal, if buoyant and well-prepared, performance, is worth so much more than the sum of its parts. It is a question of everybody knowing just how the conductor sees the work. From the outset the flautist (Andr� Pepin?) throws a shaft of sunlight into the Shrovetide fair scene and this is throughout a very happy sounding interpretation. While Monteux, the work�s first interpreter (his recording of this coupling is an essential document � see my review), characterizes vividly the contenders of the puppet show, Ansermet seems to be viewing their play from a place in the crowd. As early as the hurdy-gurdy theme we note that Ansermet, unlike Monteux, does not point the new episodes but rather lets them run into each other like dream-sequences. He shows a sense of wonder but not direct involvement, rather like Alice�s bemused contemplation of the strange, even violent, goings-on she meets in Wonderland. �Petrushka� has never previously suggested to me a parallel with Alice, so I wondered if there is some reason why Ansermet�s performance put this thought in my head. I think there is, for Ansermet, like Carroll/Dodgson, was a mathematician, and has maybe grasped intuitively the relationship between the parts in a way that eludes most of the rest of us, just as Alice�s strange journey through Wonderland had a logical basis behind it for its author�s mathematical mind. I am reminded of Ansermet�s version of Beethoven�s 9th, which was my introduction to the work. In spite of apparent shortcomings, it proceeds with such an inevitability and justness that it remains the version I always go back to; I might yet come to feel the same way about this �Petrushka�, still sounding remarkably well for its age. About the �Rite� I�m not so sure. A critic once described Ansermet as �plodding along hopefully� and certainly the �Dances of the Adolescents� are extremely slow, though there is no actual slackness to the playing. Having got through this, not all the later tempi are slower than usual and some are quite brisk. But it�s not the tempi that concern me so much as the way Ansermet seems so unsurprised by it all. To continue with the Alice metaphor, the �Rite� is one of those unfathomable creations of the human genius that, as Alice said of �Jabberwocky�, fill our heads with ideas even if we don�t know what they are. Some have suggested that Stravinsky had somehow made contact with primitive experiences hidden deep in the collective memory, not normally accessible to us, though our own hidden memories are invariably stirred by a hearing of this work. Stravinsky himself, we should recall, said that it had written itself and he was not sure where it had come from. Perhaps to Ansermet�s mathematical mind it all seemed quite normal, for the truth is that having Ansermet conduct �The Rite of Spring� is a bit like having Humpty Dumpty explain �Jabberwocky�; to take a concept from elsewhere in Alice, it may be useful, sometimes, to have such a clear explanation of what the notes mean, but what the music means, or what it is, is something else again. Of the work�s early interpreters, Monteux, with the marvellous Boston orchestra, created a thrilling post-Rimsky tone poem while Igor Markevitch revelled in the cool savagery of the writing. Both seem to me to have had something more essential to say about the piece. Stravinsky�s own versions are obviously separate cases. 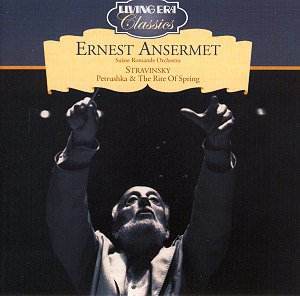 In view of Ansermet�s association and friendship with Stravinsky � until he felt unable to follow him into his last period � all his recordings of this composer�s music are historical documents, but �The Rite� is arguably less so than �Petrushka� and Ansermet�s particular gifts of cool structural logic were invaluable above all in the neo-classical Stravinsky that followed. It�s good to see Ansermet being reassessed � it�s hard to realize, now, how his Suisse Romande discs dominated the catalogue for at least two decades � but this was not necessarily the best place to start. I presume these CD transfers derive from commercial pressings, and very impressive they sound for their age. I suppose Decca themselves, with the original tapes, could do better still, but in view of the strident sound they have tended to impose on their historical material over the years, it is to be doubted whether they actually would do better.